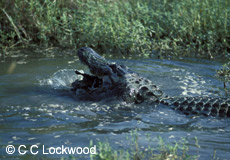 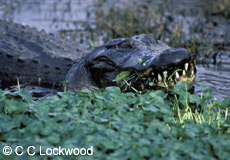 C. C. Lockwood has hundreds of images of the American alligator, covering every aspect concerning them including behaviors from mating, bellowing, and feeding to walking, swimming, defending their nests and territories, to carrying and caring for their young. 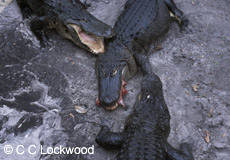 His selection of stock photos also include alligators in captivity and the wild, the entertainment industry surrounding them, products, farming and trapping, meat processing, and their relationships with biologists and the researchers who study them. 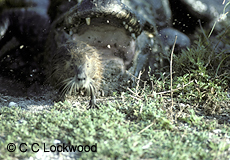 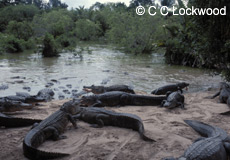 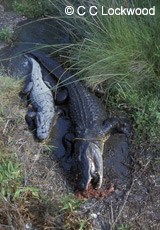 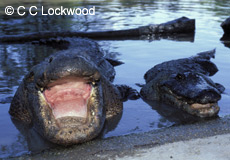 Scroll below to view links of alligators on land, swimming, threatening, hatchlings, and much more. 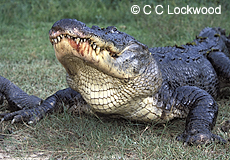 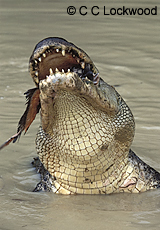 View a complete list of our alligator topics on our Stock List.